Dr.Kevin Mazur has been committed to providing excellence in dentistry in the North Hills for the last 26 years. The doctor uses the latest in dental techniques to provide you with a healthy and beautiful smile. Dr. Kevin Mazur grew up in the Western Pennsylvania town of Export. He received his undergraduate degree from the University of Pittsburgh in 1980, and received his doctorate degree in Dental Medicine from the University of Pittsburgh in 1984. He spent the next four years providing dental care at the F.O.R. Health Center in McKees Rocks, Pennsylvania. During this time, he started his own practice in Wexford in 1985. 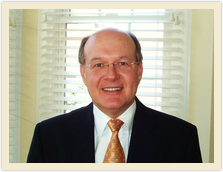 Through the years Dr. Mazur has strived for excellence in treating his patients. He has continued to provide the best care possible by maintaining his excellent standards and continuing to further his education in Dentistry. He is a member of the American Dental Association, the Pennsylvania Dental Assocciation and the Western Pennsylvania Dental Society. Dr. Mazur has been recognized by Pittsburgh Magazine as one of their Best Dentists of 2010. Dr. Mazur relishes spending his free time with his wife , Dr Ann Marie Kirsch. He is an avid golfer, and also enjoys gardening and keeping his home and office looking great.